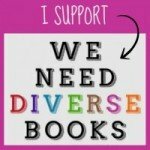 In honor of Earth Day, we’re sharing a guest post by Ava Dreams of Water author, Nancy Moss. In the sixteen years since the publication of A Long Walk to Water, awareness of the global need for clean water has grown, but unfortunately, so has the problem. 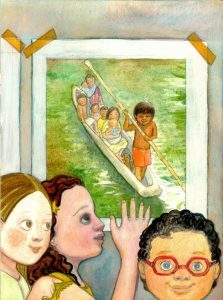 Ava Dreams of Water strives to introduce younger kids to the issue, along with ideas for how they can help, and the power of friendship and dreams. 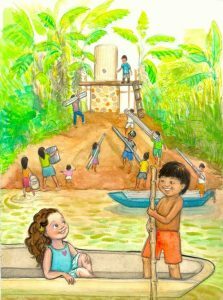 I was inspired by the work of the non-profit Rainforest Flow, which brings clean water and sanitation systems to the Peruvian Amazon. Its founder, Nancy Santullo, told me about an amazing young boy in Yomybato – where a suspension bridge and slow sand filtration system had been built – who brings people across the local river in his family’s boat. In Ava Dreams of Water, I decided to connect this boy to a child in the United States by having them meet in their dreams. With a dash of magical realism, and the wondrous illustrations by Sara McCall Ephron, the characters of Ava and Juan have a true impact on one another, as I hope the book will have on the reader/pre-reader! Clean water is one of the most fundamental needs that humans have. Earth Day gives kids the opportunity to think about what they have, what others might be lacking, and what they can do to help. Clean, healthy drinking water is a resource that no one should take for granted! This is a global issue and, indeed, there’s a growing awareness and urgency regarding the lack of healthy water in some of our American communities as well. 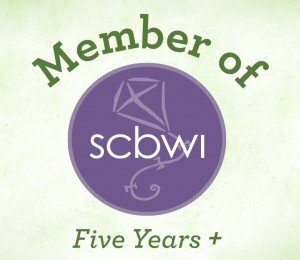 Books about the environment, green living, conversation, and the natural world all contribute to young readers’ breath of knowledge and curiosity. 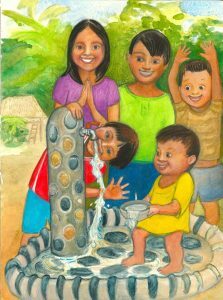 Knowing that other children do not have healthy water opens the door to empathy and action. Ava Dreams of Water is about a real place where children just like themselves have had their lives transformed by the clean water and sanitation systems that been brought to them. Across the world, water is a health, economic, and overall quality of life issue. 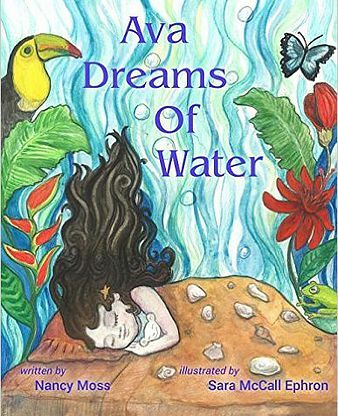 With a story of imagination, dreams and friendship, Ava Dreams of Water strives to embody the spirit of Earth Day by informing and inspiring a new generation of caretakers of the planet! 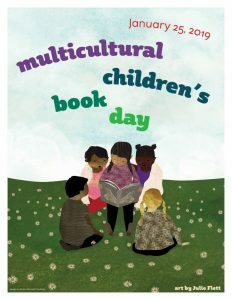 The ability of children’s books to open minds, explore worlds, and spur creative and constructive imagination is extremely powerful. It’s our hope that Ava Dreams of Water shares the idea that it is possible to change the world for the better, one drop at a time. A portion of the proceeds from Ava Dreams of Water goes to Rainforest Flow, a non-profit 501(c)(3) organization that has brought clean water to villages in the Amazon of Peru since 2003. About Nancy Moss – Nancy lives in Los Angeles with her twin sons, Gabriel and Elias. She is a former film executive and screenwriter. Learn more about Nancy and Ava Dreams of Water here. About Sara McCall Ephron – Sara writes, illustrates, and teaches art in NYC. See more of Sara’s illustrations here.